Welcome to Harbour Rose Florist website and florist business. 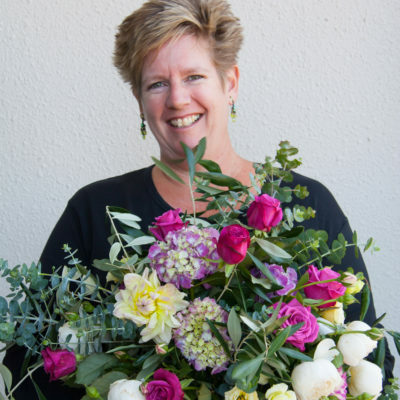 Harbour Rose Florist is an owner-operated online floral design business located in Beachlands on the picturesque Pohutukawa coast of Auckland. We specialise in Wedding Flowers Auckland wide. Offering customised floral bouquets and special occasion flowers delivered free in my local area of Beachlands, Maraetai and Whitford. After working in the medical laboratory environment for over 20 years, I decided it was time to explore my neglected creative skills. With my intuitive flair for colour and texture, it came as no surprise that floristry became my new passion and Harbour Rose Florist my new venture. Now a fully qualified and accredited Level Four Advanced Florist, I am passionate about creating unique and artistic floral designs to complement your personality, your style and the occasion. Providing personalized service and customised floral designs are my main goals. Inspiration for my floral designs is drawn from special childhood memories of my late grandmother, Phyllis, an enthusiastic gardener and amateur flower arranger. My design style is best described as big and bold, from the contemporary “just-picked from the garden” to the modern elegant and artistic designs. Creative combinations of colour ,whimsical textural elements and careful attention to detail are key features in all my designs. I pride myself on offering excellent customer service. We are reviewed on Flower.delivery-reviews.com on their 2018 list of Best Florist Options in Auckland and you might like to read our customer reviews on Facebook. Whether you need flowers for your home, workplace, as a gift for that someone special, to celebrate an occasion or for your dream wedding day, let me make beautiful flowers a part of your life. Please feel free to contact me by phone on 02102435299 or by email with any questions or comments regarding my floral designs, subscription or wedding services.